This week's winner is Michelle W. Congratulations! You have won a padlock pendant and keyhole link from Melanie Brooks of Earthenwood Studio! Send Melanie an e-mail with your address and she will get your prize out to you soon! I started teaching jewelry-making in 2006 at the Riverwalk BeadShop and Gallery which had just opened up that same year. I really wanted to be involved with this new bead shop, so owner, Nancy Plante agreed to let me teach a few beading classes. The first class I taught was how to make simple bead and wire earrings. I only had one student in my very first class. It was great! I had such a wonderful experience and that same student and I are good friends to this day! Shortly after teaching some classes, Nancy hired me part-time. I worked at that bead shop for 4 years and I taught many classes during my time there. I taught stringing, wire-wrapping, finishing techniques and knotting, to name a few. Artisan hand-forged metal links and ear wires, Irish waxed linen cord and gemstone rounds. Now, I'm preparing to teach my very first workshop at a national bead show, Bead Fest Philadelphia this August. 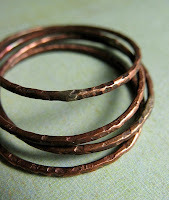 I'll be teaching a class I recently developed around my original earring designs called, Bohemian Knotted Earrings. The earrings are based on and inspired by a project made for the jewelry book I co-authored, Bohemian-Inspired Jewelry: 50 Designs Using Leather, Ribbon and Cords due out this May. Shannon LeVart of Miss Fickle Media. 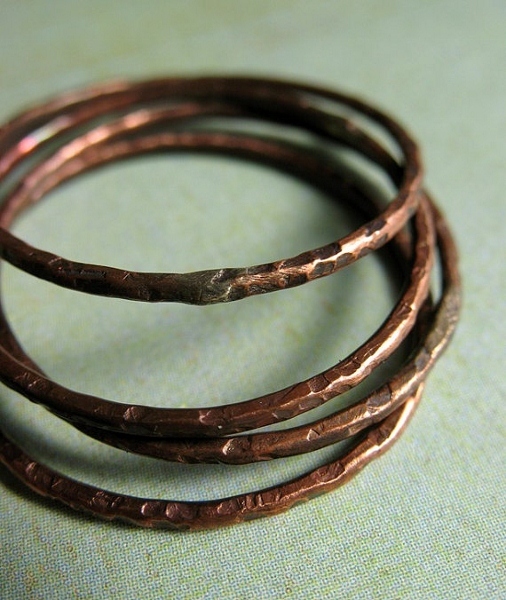 I just love her metalwork. Shannon herself, served as my muse for these earring designs, as well! Click here to go to the instructor's page and scroll down to find my name. Learn simple knotting techniques to make a trio of bohemian chic earrings! Using waxed linen cord, you will learn 3 different ways to attach colorful beads to a ring component. Students will learn basic knotting techniques to make three pairs of stylish earrings. Techniques covered in class will included: lark's head knot, half-hitch knot, overhand knot and how to use knotting tweezers for precise knotting. Using waxed linen cord, students will learn 3 ways to use knots to attach beads to a ring component. Students will have the following color choices for each pair of earrings: red, orange, green, turquoise and blue.Variations on the three designs made in class will also be discussed, so student will be able to expand on the techniques they have learned. Here are just a few examples of the earring variations that can be created after learning the knotting techniques in my class. The possibilities are endless! Do you go to bead shows? If so, which ones do you attend? Do you take any beading/jewelry-making classes at the show? 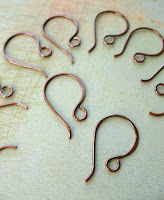 Leave a comment answering any of these questions and you will be entered for a chance to win a pair of copper links and ear wires by Miss Fickle Media. Just like the ones I use in my earring designs! 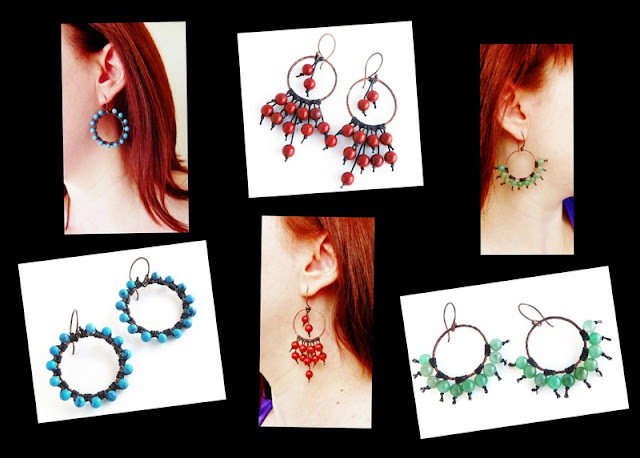 I love those red bohemian knotted earrings (center)! I just bought a little contraption that's supposed to make knotting easy and will eventually try to make something similar. I have never been to a bead show but I have dreams of going to BeadFest in Philadelphia in August. Road trip! Welcome to the Art Bead Scene Miss Erin! You are a fresh face with a lot of really awesome designs. Congratulations on the teaching! I go to the Bead & Button show and if you were going to be there I would take a class with you! Thanks for sharing this information and so glad you are here with us! I love these Knotted Earrings, especially the yellow ones secong from the top left. The only bead show that comes anywhere close is Rings & Things in March. I've missed the last two because of bad weather. It seems no one wants to come to Kansas, but I'm hoping one day that will change. I love Bead Shows! The Bead & Button is the best!! I heard there's another good one in Madison, WI the last weekend of March. Haven't done any classes yet, but it would be fun! Your earrings are the cutest! Hope to see you at the Philly Fest! I'll be there taking as many classes as I can afford. I've attended two Bead Fest Santa Fe events. Going to the Bead Fest and taking classes was a wonderful eperience and I walked away with lots of new techniques. I'm not able to go to Santa Fe this year but may be able to make the Phildelphia one. Great experience. Erin, congratulations on joining Art Bead Scene and on teaching at BeadFest. I wish I lived closer so I could take advantage of these awesome classes. Maybe you could do a online tutorial? I love shannon's links--been using a bunch of those lately. I don't take many classes, but its hard to resist hitting the gem faire when it swings by every couple of months. I have been to the Gem Fairs and Puget Sound Bead Festival. Haven't taken any classes yet. Thanks for letting us know about your classes. I attend about one or two bead shows that come to my area every year, I would go to more, but I am usually restrcited by my budget for beads. Down the Street Bead Show is where I took a class. Since I was self-taught at the begining, I needed some instructions on the finishing touches, so signed up to make a bracelet with beads bought at the show. Love bead shows, they get my juices flowing and my head full of ideas! Good luck with your class, some day I would like to travel to one of the big shows, if only to meet all my blogging buddies. Bead and Button - so close to home. I've taken classes with some great teachers. Your earrings are cute, cute, cute! Congrats on your teaching. Welcome Erin and great post. Twin Cities Bead Bazaar going on this weekend. I was not able to attend. It'a a favorite of mine. Haven't been to any bead shows lately but may get to attend BeadFest in August. No bead shows or classes for me, I'm afraid. They just don't come to Kansas. Right now it's not possible to go to them either, maybe someday! It's great that you get to teach a class, those earrings are fun and quirky! I haven't been able to attend a show or take a class...As others have said before me, they just don't come to Kansas, :( It is on my bucket list though! Your earrings are fantastic and look like a lot of fun to create! I would take a class from you if I could! 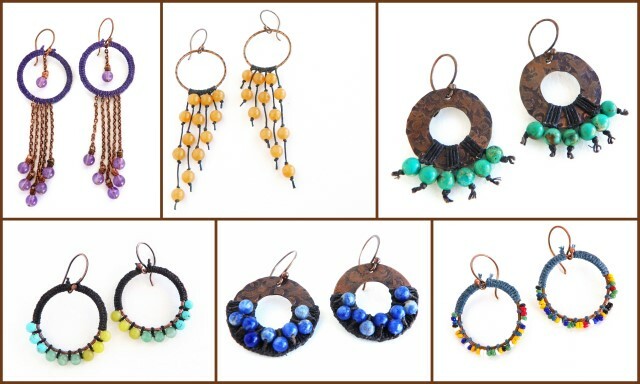 I love the blue and copper earrings in the center (last photo)! I went to my very first bead show at the beginning of this month (it was a bead show in Harrogate, England). It was so much fun, and they did offer a few different classes. I didn't attend any of the classes, since they were mostly beginner/clay, and I already do clay. What I was really enthralled with was the lampwork demo. Now that I would love a class in!